This is one profile in a series featuring the first Gator graduates who were admitted to UF through the PaCE program. 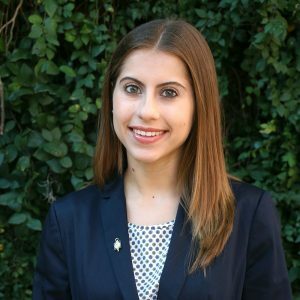 GAINESVILLE, Fla. – While some students take advantage of creating their own schedules in college by sleeping in, senior English major Alexa Tirse maximizes every minute she has. A typical day for the Miami-native begins at 8 a.m. After going to the gym, she sits down with a cup of coffee to check her email. Once she’s done checking her three different accounts – personal, school, and Student Government – she heads to class. Around lunchtime, she’ll stop by her sorority house to grab a bite to eat before setting up in the Norman Hall library for the rest of the day to get some studying done. As the day winds down, Tirse finds herself in various meetings before heading home to prepare for the next day. Over the course of three years, Tirse has gotten involved with Florida Blue Key, The Big Event service project, the Student Conduct Committee, Dance Marathon, Kappa Alpha Theta and Student Government Cabinet. Between attending meetings, sending emails, and checking paperwork, Tirse spends the same amount of time that someone would in a part-time job keeping up with all her extracurricular activities. Tirse’s passion for law and mediation led her to especially enjoy serving on the Student Conduct Committee. She sat on a board of students, staff, and faculty to hear cases of alleged violations to the student conduct code. Tirse appreciated that the school valued educational reform to suggest sanctions for the offenders, rather than immediate penalties of suspension. “Since I had so much flexibility in my schedule, I could apply to all these things and be involved in Student Government and a sorority and still be able to complete all my homework and do all my lectures,” Tirse said. Tirse said that it all came down to balance when juggling her academic, extracurricular, and personal responsibilities. She said that the ability to create her own schedule of online courses the first year of PaCE allowed her to join different organizations right off the bat as a freshman living in Gainesville. But, she did have to sharpen her time management skills, Tirse said. With the completion of her senior thesis, Tirse hopes to graduate with high honors in the Spring. After graduation, she will attend Cornell Law School to study international or corporate law. She aspires to be a lawyer working in the private sector as a part of a firm or corporation’s legal team. Alexa Tirse often spent her days at the George A. Smathers Library because its Latin American and Caribbean Collection was a good resource for her senior thesis. The English major studied Operation Pedro Pan, a mass migration of more than 14,000 unaccompanied Cuban children to the U.S. when Fidel Castro rose to power. Her grandfather was one of these children. Read the stories of other PaCE graduates here.